Citation Information: J Clin Invest. 2016;126(11):4331-4345. https://doi.org/10.1172/JCI85740. (A) Representative H&E stain of normal skin. Dashed line indicates the division between the epidermal/dermal and DWAT fractions. n = at least 3 mice. (B and C) Skin was left unfractionated or separated into epidermal/dermal and DWAT fractions and prepared for flow cytometric analysis. n = 5–7 mice per condition over 3 to 4 experiments. (B) Gating of epidermal and mesenchymal cell populations. (C) Cell numbers of each population in indicated fraction. Numbers are reported per 8-mm punch. 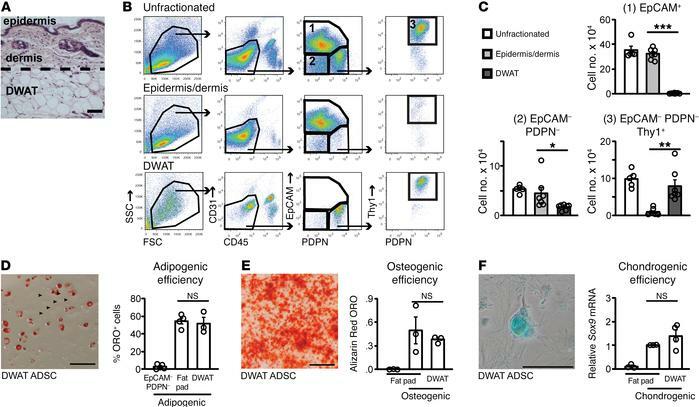 (D) Adipocyte differentiation of isolated EpCAM–PDPN– cells, inguinal fat pad ADSCs, or isolated DWAT ADSCs. Left: Representative Oil Red O–stained (ORO-stained) culture. Arrowheads point to undifferentiated cells. Right: Adipogenic efficiency. (E) Osteogenic differentiation of inguinal fat pad ADSCs or isolated DWAT ADSCs. Left: Representative Alizarin Red–stained culture. Right: Osteogenic efficiency. (F) Chondrogenic differentiation of inguinal fat pad ADSCs or isolated DWAT ADSCs. Left: Representative chondro-nodule in Alcian blue–stained culture. Right: Chondrogenic efficiency. (D–F) Symbols represent independent experiments. n = 3–5. Scale bars: 50 μm. *P < 0.05, **P < 0.01, ***P < 0.001 using 2-tailed unpaired Student’s t test. Error bars depict the SEM.